I'm sure we all have that one happy place in our mind that always reminds us of our past; a place that gave us so much memory it became the beacon of our childhood. For me, that place is Tokyo DisneySea, which I always remember as a place of "adventure, romance, and mystery." I visited the park for the first time in 2003, approximately 21 months after it opened its gates to the public. All I can remember was that I had a magical time visiting this park as a child: my family and I didn't stop running around, hopping from one ride to another, hurtling through the rainy June climate in Tokyo as we chase for those highly-coveted FastPass tickets. Welcome to Tokyo DisneySea, without doubt the world's best theme park. Fourteen years later, there I was at the same exact theme park, but this time... I visited the park as a young adult in my early 20s. I've gained a whole new perspective since I went in 2003 through my travel, study, and work experience. Surely this allowed me to enjoy the park in an entirely different way. But one thing remains the same: Tokyo DisneySea remains - and perhaps will always be - the world's best, most immersive theme park ever created in history. Tokyo DisneySea was - and still is - the most expensive theme park ever built. The park opened its gates on September 4th, 2001 at a cost of JPY 335 billion. At today's rate, that would amount to approximately USD 3 billion. Note that this is the cost of a single theme park, not the entire theme park resort. To date, I'm confident that Tokyo DisneySea remains the theme park with the world's highest asset // property value. But what made Tokyo DisneySea so "expensive"? Mount Prometheus as seen from S. S. Columbia in American Waterfront. Firstly, the attractions. Prior to its opening, Tokyo DisneySea was renowned for a theme park that went all out in terms of developing its attractions. Rumour has it that the management company of the park - Oriental Land Company (OLC) - went to Disney and said, "I don't care about budget, just give us the best attractions you can ever imagine. Give us mind blowing ideas." The result was and is, indeed, mind blowing. We'll get to the attractions soon in later section. Secondly, the theming. To say that Tokyo DisneySea is the most immersive Disney theme park ever created is an understatement. It is - in fact - the most immersive theme park ever created on Earth. Oh, you might argue that The Wizarding World of Harry Potter or Pandora: World of Avatar is more immersive. Sorry, but I'll politely reject that argument. Whereas "Harry Potter" and "Avatar" are merely stand-alone area within a theme park, Tokyo DisneySea is an entire theme park. A replica of the town of Cape Cod, MA at Tokyo DisneySea is one of my favourite spots at the park. Mediterranean Harbour is the park's port of entry; an imaginary port Italian town based on Venice and Portofino. Tokyo DisneySea's main entrance goes under the in-park Hotel MiraCosta, providing a grandeur view of the park's icon, Mount Prometheus. If there's one principle that I can totally commend about Tokyo DisneySea's approach to designing the theme park, it'd be the strict NO DETAILS SPARED principle. While going around the park looking for design and quality flaws, aside from the construction walls that are appearing in a couple of spots, I must admit I found very little to complain about. In this park, no details are too small. Each themed area - or port - is incredibly detailed in all senses: sight, smell, hear, and taste. Even the touch sense is also evoked: the pathways that you step on under your feet differs from one area to another. Lost River Delta took guests to a Mexican-themed treasure hunt adventure. American Waterfront beautifully brings the Roaring '20s era of New York back to life. Visitors taking turns shooting photos with Abu in Arabian Coast. In summary, if you're looking for a theme park that has top-notch and memorable attractions and ambience, then Tokyo DisneySea is - without doubt - the best choice that you can go with. I think the only downside to Tokyo DisneySea is that it's located in Japan rather than in the U.S., which would make it rather costly to go to. But it's definitely worth the trip especially if you're already planning a trip to Asia. After all, it's the world's best theme park. It's worth visiting no matter what. Tokyo DisneySea: Disney's First True Adult Theme Park? Many theme park enthusiasts around the world often assume Tokyo DisneySea as the first - or second if you consider Disney's underwhelming, almost-failing theme park, Disney California Adventure - Disney theme park to be mainly targeted towards adult visitors rather than family and children. This might sound puzzling to you as Disney brand is often associated with princess stories, animated films, and tame rides (albeit immersive) in its theme parks. If I hadn't gone to Venezia, I wouldn't have appreciated this area as much. I remember when I visited Tokyo DisneySea in my early teens, all I cared about was "doing." I kept hopping from one ride to another, running around non-stop from 8:00am to 10:00pm, disregarding anything on the way. All I thought was, "Get FastPass for this, then ride this, this, that, that one, this one, back to that one..." Even I didn't care about food and shows. All I wanted was to ride something as many times as I can within that 14-hour span. Mermaid Lagoon's exterior from across the river. Going back to the park as a young adult allowed me to appreciate the true beauty and light that this park possesses. Having travelled more around the world since I visited 14 years ago, I have come to respect the details that are abundant throughout the park. The Venetian Canal section of the park, for example, is my favourite spot at the park. I went to the real Venezia in March 2016 and I loved my visit so much. My trip to Tokyo DisneySea reminded a lot of my visit there a year ago. They even completed the experience with real Italian-singing gondoliers. Venetian Gondola is perhaps the most unique attraction, complete with Italian-singing gondoliers. As I was sipping my frozen beer that I purchased in the Mysterious Island and gazing at the erupting Mount Prometheus, I've come to realise of how much I've changed as an individual. As a young adult, my appreciation towards theme parks no longer relies exclusively on attractions, but also many other aspects: food, sightseeing, vibe, photo spots, smell, feel, and many other factors that I can't mention one by one. Rather than simply "doing", visiting a theme park as a young adult feels more like "feeling". You feel everything around you with your senses and then decide whether you get a good feeling from visiting the park. Your judgement towards how good or bad a park is is now based on a well-rounded package: the experience itself. The Venetian Gondola is the most memorable experience of the park for many. In terms of Tokyo DisneySea itself, what makes this park a Disney experience that can be fully enjoyed by adults aren't because of the park's design and attractions, nor the existence of alcohol and romantic backstory. Rather, it's because the park - despite being a Disney park - doesn't try hard to be a Disney park. Instead of embellishing every single corner and element in the park with Disney references and symbols, the park pays homage and respect to experiences that general adults can truly appreciate in the outside world in the best way it can afford. Adults finally find the American Waterfront section very enjoyable. That doesn't mean Tokyo DisneySea is exclusively for adults, however. Children will still have plenty of things to do. Nevertheless, Tokyo DisneySea is one of those few theme parks around the world where adults and children can have equally great time when they pay a visit together. Be it the rides, the food, the shows, nor simply the enjoyment, Tokyo DisneySea seems to have plenty of things to offer to all types of demographics. As mentioned earlier, the attractions at Tokyo DisneySea aren't only top notch. Most of the rides here are original and unique, exclusively made for the park. Occasionally, the rides are copied from other Disney parks, but even then Tokyo DisneySea take those rides a notch up further by investing massive budget in putting elaborate theming to ensure that they meet the quality standard that is expected from the park; that they blend perfectly with the surrounding themed area. Without further due, let's get into what this park has to offer right away! On the day of my visit, people were literally sprinting like Usain Bolt to the back of the park. After I got my FastPass for the usually uber-popular Toy Story Mania, I followed the crowd to experience the newest ride at the park: Nemo & Friends SeaRider. Located at the Port Discovery area, the attraction was opened on May 12, 2017, only 3 days prior to my visit. Nemo & Friends SeaRider's wait time was 100 minutes long at 9:25am (85 minutes after the park opened). I ran quickly enough to secure a place at the front of the queue, allowing me to wait for only 30 minutes. Nemo & Friends SeaRider can be easily described as a gentle, next-generation simulator ride that includes effects covering special lighting, water effects, small screens on the entry // exit doors at both sides, and ultra high definition main screen at the front. This isn't another copy of Star Tours, however. Each simulator cabin on Nemo & Friends SeaRider can hold up to 122 people per cycle, which makes it a much bigger simulator ride than Star Tours. The attraction experience begins with a pre-show presentation explaining the backstory of the ride. Guests are apparently paying a visit to the newly formed Marine Life Institute of Port Discovery. Today, the institute announced the discovery of a new (imaginary) chemical element called "Chidiminium", which allows them to shrink objects when they're submerged under water. The Marine Life Institute uses this element to shrink the fish-shaped submarine that the guests are about to board so that they can swim with the fishes: you guessed it, Nemo and friends themselves. The Marine Life Institute of Port Discovery, home to Nemo & Friends SeaRider. Nemo & Friends SeaRider is somewhat an underwhelming experience for me, however. I remember how the ride that it replaced, StormRider, was a much wilder and intense experience. Nemo & Friends SeaRider's motion is relatively tame compared to even Star Tours, which itself is a far better and more immersive experience. Other than the water spray effect towards the end of the ride - which left many riders surprised and screaming for cover, literally - it didn't excite me enough to obtain another FastPass to ride it again. Nevertheless, I must commend on the "kawaii" factor of the ride. It's cute, it's adorable, and it's nevertheless an enjoyable ride especially if you want to escape the sun for a bit. But is it worth queueing 100 minutes for? I say no. Others might say differently, but I'd say definitely no. 6/10. Following my first ride of the day, I walked to the back-most portion of the park, Lost River Delta, which possesses one of the premier rides of the park, Indiana Jones Adventure: Temple of the Crystal Skull. Housed in an Inca pyramid structure that spreads along the area, the attraction surely brings about a huge first impression to the visitors. The main Inca pyramid that houses the Indiana Jones Adventure ride. Just like its sister ride at Disneyland in Anaheim, CA - whose exterior is far more down to earth - this version of Indiana Jones also has an exquisitely detailed queue. After meandering in and out of the temple a couple of times, guests finally enter the core of the temple into a seemingly Inca ritual room with a lot of human skulls scattered on the floor below. On the ceiling, visitors can enjoy (or be frightened by) the mural painting that seems to give warning to the guests of the danger waiting for them. The elaborately detailed queue of Indiana Jones Adventure. Following the queue, guests board one of the jeeps that will take them deep into the temple to obtain the much-coveted treasure, the "crystal skull." As expected, things go awfully wrong and before we know it, we're thrown deep into the wrong corner. Now, it's no longer a treasure hunt journey! It's an escape! We have to get out before it's too late! Oh no! What are we gonna do!? Quick! We have to escape before it's too late! While similar in execution, this version of this ride carries notable differences to the original version located in Anaheim, CA. Overall, though, I feel that Tokyo DisneySea's version trumps the original version of the ride. 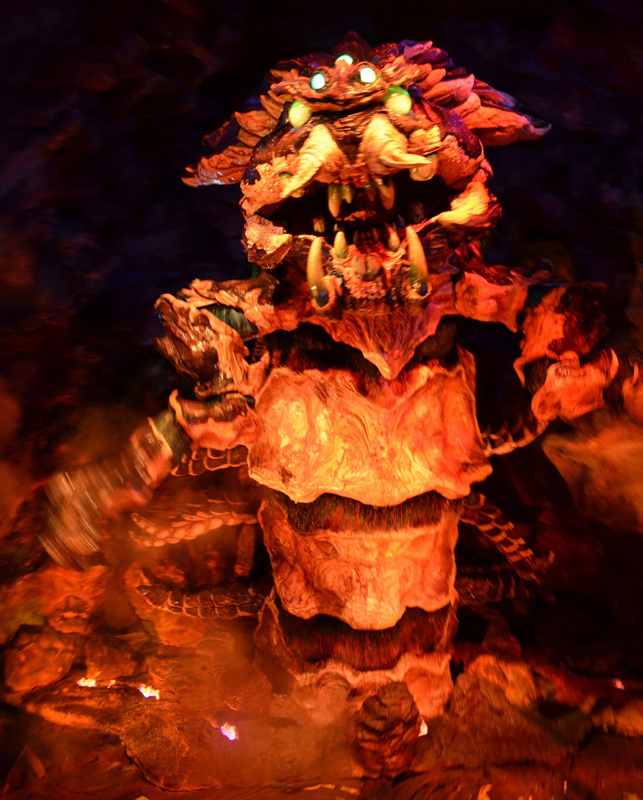 With effects and decoration that are superior - including the water vortex and the fog ring effects - as well as the vehicle movement that is far more dynamic than that of Disneyland, Indiana Jones Adventure: Temple of the Crystal Skull is a ride that is worthy of mention as one of the world's best theme park rides. 10/10. This ride has so many things to see that one ride just simply won't cut it. If you have time, go take another spin on this ride. If you don't mind getting separated from your party or if you're a lone visitor, ask the Cast Member for Single Rider access! This will cut your wait time significantly. Tucked right next to Indiana Jones Adventure is a small roller coaster with a 360-degree vertical loop called Raging Spirits. A roller coaster that tells the story of an excavation site gone awfully wrong after the displacement of artefacts here and there, Raging Spirits takes the guests into the middle of a battle between the God of Water and God of Fire. While it's not a huge roller coaster and is far from being a top-tier ride at the park, the ride still carries elaborate theming that is consistently showed throughout the park. Down to the loop we go! With a top speed of merely above 37 mph, Raging Spirits is definitely not an intense roller coaster. If it isn't because of the loop, Raging Spirits would easily be a family roller coaster. Nevertheless, the loops gives it a certain novelty of being an "adult" roller coaster. Thanks for its rather small size, Raging Spirits is a perfect roller coaster for those who would like to go on their first inverting roller coaster. Raging Spirits is one of those roller coasters that give significantly different experience during the day and at night. After the sun goes down, the effects come into full play. Special lighting, fire effects, mist, and advanced lighting make the ride a more well-rounded and exciting ride. If you have time, try riding both during the day and at night! To save time, once again ask for Single Riders line access to cut waiting time to minimum. 7/10. Raging Spirits' exterior structure provides a glorious view of the battle between fire and water. Through the fire we go! Following the previous three rides, it was finally time for me to ride the park's most popular ride: Toy Story Mania! Similar to its sister versions in Anaheim, CA and Orlando, FL, Toy Story Mania is a shooting dark ride themed to Toy Story. Guests board one of the 4-passenger capsule, wear their 3-D glasses, and attempt to obtain the highest scores possible as they transition from one carnival game to another. Toy Story Mania is a shooting dark ride themed to Toy Story. Guests are taken to multiple carnival games, from ring toss to dart throw, that take place on the screens in front of the riders. Each game lasts approximately one minute long. Guests aim and shoot by pulling on the round-shaped knob in front of them. Due to its interactive and "score" nature, it's no wonder this ride is so popular. This is an attraction that can be enjoyed by both adults and children alike. The idea of "playing a game" is fun enough, despite the fact that the ride itself is - well - subpar compared to other rides at the park. Unlike its sister rides at the U.S. however, this version is a far better themed attraction. The ride even has its own mini-land within the American Waterfront area. I mean... check these out. Toyville Trolley Park is a newly made area exclusively for Toy Story Mania. Toy Story Mania at night is a unique experience on its own. If you want to ride Toy Story Mania, either ride it first thing in the morning or obtain FastPass tickets for it. While it's not a chart-topping ride, it's a fun ride that you'll never get enough because you'll always want to score better in your next ride. 8/10. Back in 2003, American Waterfront was a relatively dead area due to lack of highlight attractions. Today, it's the most crowded area in the park thanks to two popular attractions that are housed in this area. We already talked about the first one (Toy Story Mania). The second ride is located right next to Toy Story Mania: soaring 200 feet up into the sky, it is the one and only... Tower of Terror. Tower of Terror dominates the skyline at the American Waterfront area. While in terms of ride system it is merely a carbon copy of the similar ride in Anaheim, CA and Paris, France, Tokyo DisneySea's Tower of Terror abandons the usual Twilight Zone theming and instead goes the original storyline path. In this version, rather than taking a journey into the fifth dimension, guests take a tour of the long-abandoned Hotel Hightower in New York City. The year was 1912, and the hotel was finally opened for a special tour after a mysterious disappearance of the owner, Harrison Hightower III, on the New Year's Eve of 1900. The backstory of Tower of Terror: where did Harrison Hightower III go? The pre-show of the ride proves to be my personal highlight of this ride. 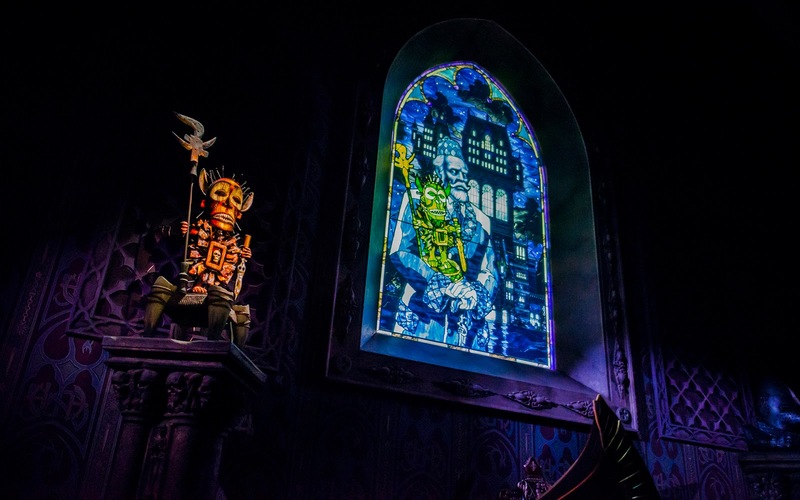 After a brief introduction to the storyline done through a model gramophone, the story takes a dark turn when Mr. Hightower himself appeared and told the story through a hypnotic stained glass screen. Then comes the effect that blows literally everyone in the room: the cursed, so-called Shiriki Utundu statue that was displayed in the room suddenly disappears. No trace whatsoever. It's an amazing effect done by Disney. Shiriki Utundu before its disappearance in the pre-show room. 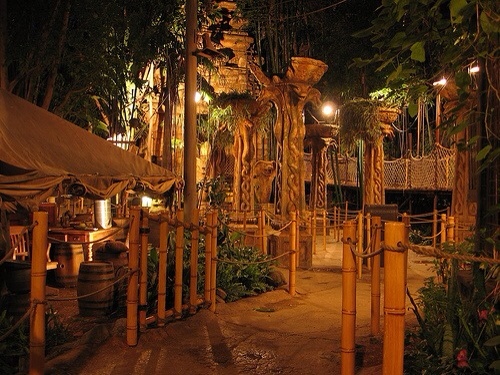 Guests then proceed to the artefacts room, which is also the boarding area to the main ride itself. Once on the ride itself, the experience is practically very similar to that of the Anaheim version. The show scenes, however, were replaced by two different ones: one showing how Shiriki Utundu sent Harrison Hightower into his doom on that fateful night and another one with a mirror showing the cursed idol absorbing the souls of the riders. The elevator that the guests are on board on now goes into full up-and-down mode. The experience is far less intense compared to the Anaheim, CA version, which was a major disappointment. While riders still experienced zero and negative G-forces throughout the ride, the drops feel considerably tamer thanks to the more elaborate restraints used on this version. Rather than simply a seat belt on the waist, Tokyo DisneySea's Tower of Terror seat belts also uses over-the-shoulder system, making it similar to the ones you wear when you're driving a car. Let us all be thankful that we never had this problem in our lives. While this Tower of Terror wins in terms of backstory and theming, it loses big time in the ride experience itself, considerably tamer (MUCH tamer) to its Paris and Anaheim counterparts. Nevertheless, it's still a wonderful ride, though it comes below my expectation. 9/10. By the time I finished Tower of Terror, it was still around 10:30am. Having read reviews that Big Band Beat is a show not to be missed at the park, I entered the lottery and... I lost. I wasn't selected to watch the show. Fortunately, on the day of my visit, the show had a single non-lottery show at 12:20pm. The line had already started forming by then, but it wasn't too full to a point that I had to immediately get into the line, so I decided to go on a ride that had a low wait time: Sinbad's Storybook Voyage. Sinbad's Storybook Voyage's entrance is barely recognisable. When I arrived at the entrance of the ride, I was immediately puzzled by how empty the queue was: it was a literal 5-minute wait. In comparison, top rides like Tower of Terror and Toy Story Mania already racked 90+ minutes wait at the same time. Is this ride that unpopular? Really? Sinbad's Storybook Voyage turned out to be a gentle boat ride that takes riders along Sinbad's journey - you know the story, right? - as he encounters both good and evil beings. The ride strikes a similarity to the classic It's A Small World attraction, which is located right next door at Tokyo Disneyland, as well as other Disneyland(s) around the world. It's slow-moving, it's family-friendly, and it's bright. It's also surely annoying if you end up not a fan of the ride because that means you'll be stuck on the ride for around 10 minutes. One of the colourful show scenes on Sinbad's Storybook Voyage. One thing that I prominently like about Sinbad's Storybook Voyage is its soundtrack. The ride soundtrack titled "Compass of Your Heart" - composed by Glenn Slater and Alan Menken, who is known for his work on Disney's most renowned movies from The Little Mermaid to Hercules - is undeniably the most memorable soundtrack you'll ever listen at Tokyo DisneySea. With its orchestral composition and gleeful vibe, one will simply be unable to resist humming along the tune after the ride. Really, this tune is going to get stuck in your head for a long, long time. Sinbad's Storybook Voyage is a gentle boat ride that is perfect for family visitors; for those who want to escape the summer heat or the winter cold of Tokyo. While the ride itself is not an "E-Ticket" category, it carries that extra point for its memorable and hypnotic soundtrack. Ride this only if it doesn't have too-long wait time. 7/10. There has been a lot of reviews online speculating that Big Band Beat is one of the best Disney shows ever created. Having tried the lottery system earlier and miserably failed to obtain a ticket, I decided to brave the line by entering the queue a full hour before the 12:20pm (the non-lottery show) commenced. "This better be good," I said to myself. By the time I arrived, as expected, the line had already gone back and forth three times. Big Band Beat's queue an hour before showtime, reflecting the show's popularity. Set in a full-scale Broadway-style theatre, Big Band Beat is supposedly a revue show with pieces from the Roaring '20s era with Disney characters here and there. Rather than a full-fledged Disney show, it's a live stage show that pays homage to the charm and artistry of New York '20s live performances a la Broadway. Once the door opened, I ran a little to get the best possible seat in the middle orchestra section, giving me a fully symmetric view of the stage. I was so excited. Having heard so many fantastic reviews of it, I was expected to be blown away. Big Band Beat is, without doubt, the best live stage show Disney ever created. Big Band Beat isn't a show that tries hard to be Disney. Rather, it's a tribute show that pays homage to the New York artistry with smart inclusion of Disney magic in its score, from the scatting section to the dance piece. The performers in this show are top-notch, arguably the best I've ever seen in a Disney show. From the tap dancers to the big band ensemble, from the vocalists to the Disney characters - even the Mickey Mouse in this show can legit drum! - they worked so harmoniously to create a show that pays proper respect to the original time and performances that inspired Big Band Beat. I'm sure that for the many years to come, there will be no other Disney show that is as charming, as exciting, as popular, and as memorable as that of Big Band Beat at Tokyo DisneySea. Whether you win the lottery or not, Big Band Beat is a must-see show at the park. If you lose the lottery, don't take a second thought and get in line for the first show of the day (the non-lottery show). You won't regret it. 10/10. If I can give this show a 10.5 out of 10, I will even be happy to do so. Getting out of the Big Band Beat show, I was so mesmerised to a point that I didn't want to be let down by anything that could potentially disappoint me. So I walked my way up to the Mysterious Island and get in line for the park's signature attraction, Journey to the Center of the Earth. Inspired by a novel of the same name penned by a French author named Jules Verne, the ride has impressed many theme park enthusiasts for its immersion and perfect execution of the ride system. The Mysterious Island's Mount Prometheus houses the park's signature attraction, Journey to the Center of the Earth. I remember of how short this ride is in reality; of how the ride starts merely as a stroll going through the magical subterranean world with beautiful sight of a crystal cave and mesmerising alien underworld complete with weird creatures here and there. Unfortunately, the ride took a wrong turn after a tunnel collapsed and now the vehicle had to pass dangerous area: the cave of lightning and the grand finale... the encounter with the giant centipede monster. From here, the vehicle then blasted upwards at a speed in excess of 45 mph and went through a 50-foot drop before going back to the station. And oh boy, did it still impress me. This ride was still at its top-notch state even after 14 years. The grand finale brings guests face-to-face with the centipede monster; one of the most dynamic and impressive animatronics ever created in the theme park history. From the pre-show terravator ride that seemingly takes guests deep down into the core of the Earth to the different show scenes that the riders go through, Journey to the Center of the Earth is the manifestation of what Walt Disney Imagineering can truly do if not constrained by bureaucracy and budget matters. The execution of the ride system is also top-notch, comparable - arguably even better - to that of Radiator Springs Racers, which itself is deemed as one of Disney's best rides ever created. For what it lacks in length and duration, Journey to the Center of the Earth makes up for in completely immersive attraction experience from start to finish. From the queue to the exit point, from the terravator ride to the grand finale full of special effects utilising fire, thunder, and strobe light effects. Oh and don't get me talking about that finale drop at the end, which is fantastic and gets you out of your seat for full 3 seconds. This is, without doubt, Disney's best ride after Pirates of the Caribbean: Battle for the Sunken Treasure. 10/10. Located right next to Journey to the Center of the Earth is a dark ride that is seemingly take place under water - thanks to its location being technically under water - but actually utilises the same ride system as Peter Pan's Flight. Themed to another novel of same name by Jules Verne - yes, basically the entire Mysterious Island area is themed after Jules Verne's work - 20,000 Leagues Under the Sea is a relatively gentle dark ride that takes guests on a journey to discover the new world of deep ocean. The main entrance to 20,000 Leagues Under the Sea. The ride vehicle for this ride is something that Disney does not typically do. Rather than being a standard, open air vehicle, the ride utilises a fully enclosed "capsule" that seats 6 passengers at a time, which then divided further into 3 groups of 2. In a capsule, there are 3 benches - seating 2 each - facing glass windows in 3 different directions. The glass windows act as mediums to give the riders the illusion of going underwater through means such as bubbles, water flow, and others. After riding Journey to the Center of the Earth, 20,000 Leagues Under the Sea can feel downright underwhelming - yes, I said that. But that's fully understandable because it's - after all - located right next to one of the world's best theme park attractions ever created. This? No match. Sorry, but it's just not. While the fact that guests are able to control the search lights to look around from inside the vehicle, the ride is practically only a more elaborate version of Peter Pan's Flight. It's simply a ride with a lot of blacklight effects and props here and there. 20,000 Leagues Under the Sea takes riders into the deep abyss of the ocean. Despite its status as a rather C- or D-ticket ride, 20,000 Leagues Under the Sea should be commended for the effects it utilised on the ride vehicle itself. From the sound of hissing gas as the Cast Member closes the door to the controlled climate feel inside the vehicle, 20,000 Leagues Under the Sea provides a unique and realistic experience of being inside a submarine vehicle. Still, it's not a must-ride. But do ride it if it has a wait time of lower than 30 minutes. 7/10. Aquatopia, known as "the most pointless ride" ever created by Disney. Utilising trackless technology and covering a huge space with two different ride sides, Aquatopia takes guests on random paths as they explore the many water fountains, waterfalls, and caves in the area. Not much to be seen and the execution itself is a far cry compared to that of Pooh's Hunny Hunt. 4/10. Aquatopia is one of the most pointless rides ever created by Disney, despite its impressive technology. Mermaid Lagoon, which itself is actually an entire themed area in the park dedicated mostly for children and infants. The area is fully indoor and features typical carnival rides, though elaborately themed (once again). The area is detailed and is worthy of coming into if the weather outside is not favourable. 8/10. Mermaid Lagoon is a fully-indoor theme area at Tokyo DisneySea. Flounder's Flying Fish Coaster is one of the two roller coasters at the park. Out of Shadowland, a relatively new live stage show at the Lost River Delta area that utilises smart use of projection mapping. The show, however, is distinctly Japanese thanks to its performers and acting style (very, very Japanese). Even the singing feels Japanese. Yet that's what makes this show charming in its own. Still, it doesn't have the same chart-topping X-factor that Big Band Beat does. 8/10. Fortress Explorations, technically a playground that is specifically targeted towards adults. It features many exhibits that can be appreciated only if you know what you're dealing with. For example, the planetarium, the illusion room, and the giant pendulum clock exhibits are particularly immersive, taking you straight into the world of adventure, romance, and mystery that the park promises. 9/10. Fortress Exploration's planetarium is one of the park's true highlights. 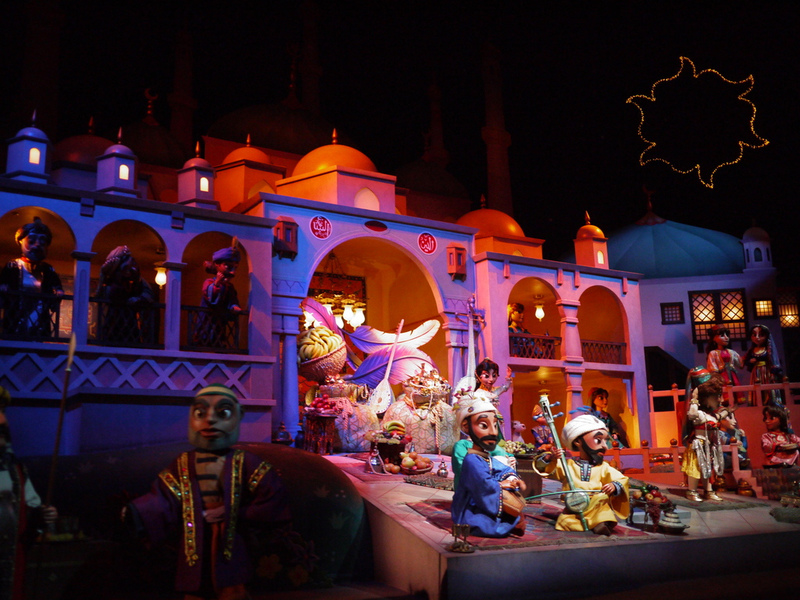 The Magic Lamp Theater, a 3-D ride that features live performance by live actors. Think of it as Disney's tamed version of Terminator 2:3-D. Yet, I wasn't really impressed by this attraction in general. The effects and the visual don't seem convincing enough and I don't feel this meets the expectation that is expected of Tokyo DisneySea. 6/10. Venetian Gondola, a gentle ride on a true, authentic Venetian gondola around the Mediterranean Harbor and Venetian Canal area. Truly mesmerising, memorable, and as authentic as it can be. The gondoliers themselves can sing in Italian. Wait until they sing "Santa Lucia" under the bridge towards the end of your boat ride. 9/10. Going to Tokyo DisneySea is a feat that you can be proud of. It's without doubt the best theme park around the world if you consider the immersion and the details it possesses, which hasn't yet been met at the same scale by other theme parks around the world. Tokyo DisneySea in the evening brings an entirely different light. 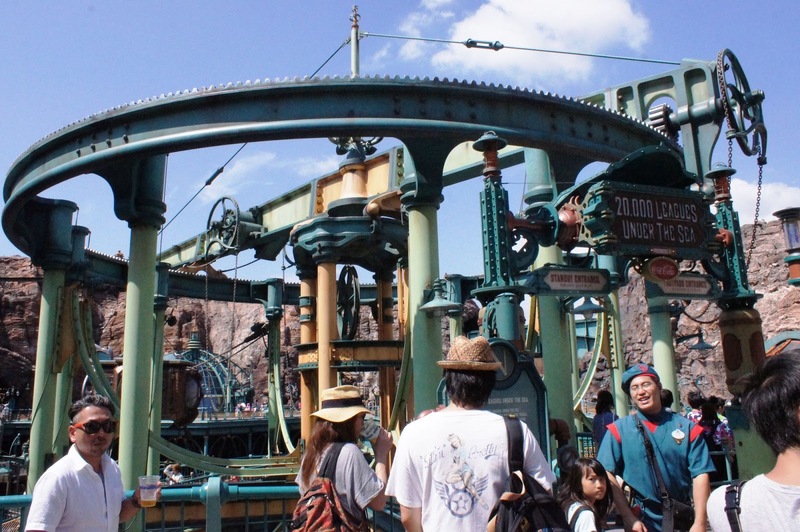 From its relatively more thrilling and intense rides, to the incredible attention to detail it puts in the design of each area, Tokyo DisneySea surprises many visitors because adults find it more appealing than the children. It's no wonder why. While still strong in the "doing" side of theme park, Tokyo DisneySea is even stronger in creating that vibe of adventure, romance, and mystery that the park promises, of which they have strong appeal towards more mature visitors. In the next post, I will be providing my own tips and tricks on how to navigate your day at Tokyo DisneySea. In the meantime, stay excited, stay fresh, and keep living your live... ONE THEME PARK AT A TIME. Can't hardly wait for my trip in Nov! November shouldn't be too crowded, so you're all set for a wonderful visit!